This data product is constructed from Remote Sensing Systems (RSS) Version-7 microwave radiometer total columnar water vapor values (also referred to as total precipitable water, TPW). The product is updated monthly and available at www.remss.com. One netCDF file contains all the data and is named tpw_v07r01_198801_YYYYMM.nc, where YYYY is the most recent year and MM is the most recent month of the data in the file. We will update this file monthly. The V07 signifies that the data are made from the Version-7 RSS data (this will not change until the RSS input data are a new version). The r01 signifies this is the first reprocessing version of the TPW product (V00 was the original version). We added AMSR2 to the product and changed the post-hoc adjustments to those given in Wentz, 2015. Due to these changes, we incremented the revision number in Jan 2016. We expect to update the climatology data once per decade and will increment the version number at that time. 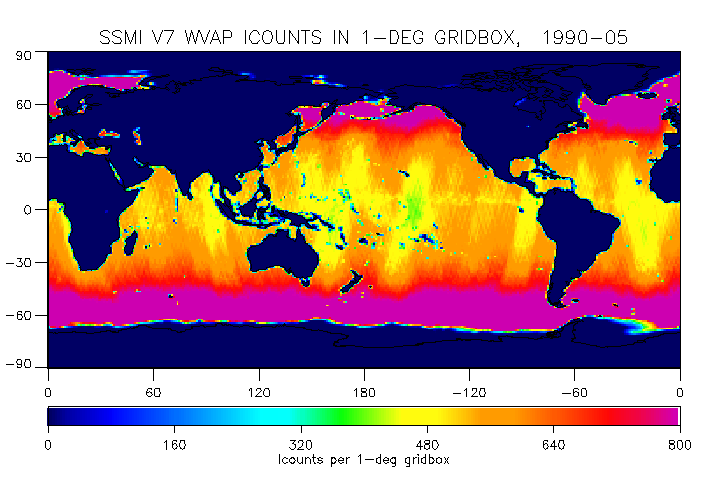 We have constructed a merged, 1-degree total precipitable water (TPW) data set using the version-7 (V7) passive microwave geophysical ocean products publicly available from Remote Sensing Systems (www.remss.com). The TPW values come from the following satellite radiometers; SSM/I F08 through F15, SSMIS F16 and F17, AMSR-E, WindSat, and AMSR2. These microwave radiometers have been carefully intercalibrated at the brightness temperature level and the V7 ocean products have been produced using a consistent processing methodology for all sensors. These high quality ocean data are made available to users thanks to funding from the NASA MEaSUREs project. The strong spectral signature of water vapor makes it a robust parameter to retrieve from microwave radiometer measurements. Comparisons with small-island radiosonde measurements and and ground-based GPS water vapor data demonstrate rms errors of ~1.0 mm. We find GNSS values are in better agreement with V7 water vapor values than with those of previous RSS versions. This document highlights the construction of the merged product which contains monthly, 1-degree TPW means, a 12-month climatology made using 1988 to 2007 data, monthly anomaly maps, a trend map with associated global and tropical TPW time series and trends, and a time-latitude plot. The data set was originally released in January 2013 in netCDF format and was reprocessed in January 2016. It is accessible by FTP (ftp.remss.com/vapor), OpenDAP, and browse imagery. The product is updated monthly and will continue for as long as microwave satellite radiometers are in operation. This TPW product is made using a two-step construction process. First, we make monthly 1-deg maps from the individual satellite water vapor values, keeping track of number of obs, number of ice obs and the mean day of month. We re-grid using cosine latitude weights to reduce from the 0.25 deg grid of the RSS satellite products to the 1-deg grid of this product. In the second stage of processing, we apply quality control measures, apply post-hoc adjustments, and combine TPW values from all instruments using simple averaging. The resulting TPW product was constructed using the following requirements: We only calculate a TPW value for a specific 1-deg grid cell if the cell contains more than 160 observations during the month, if ice is present for <= 30 of the included observations, and if the calculated mean day of the month (derived by averaging the time of the data falling within the cell) is within 6 days of the center day of the month. Three satellite-months did not meet our requirements: F08 in Jan 1988, F08 in Oct 1990 and F10 in Dec 1991. In each case, the month values are needed for consistency of the time series so an exception was made and the data were included. These quality checks were applied in the second stage of processing. In developing our methodology, several aspects of data product construction were explored, including geographic sampling, minimal data number requirements, ice flagging, rain flagging, averaging methods, analysis of offsets and need for small bias corrections. These are further described in the following paragraphs. The quality of the vapor product produced is dependent on the number of data that are averaged into each grid cell. Land and ice proximity affects this number. Radiometers suffer from side lobe interference that prevents obtaining vapor values near land. Due to variations in instrument resolution, look angle, geographic conditions and spatial footprints, some pixels have more observations than others. This results in varying numbers of observations for a given grid cell and poorer quality averages near coastlines and along ice edges. We tested a variety of minimum observation requirements. The figure below shows the count of water vapor data in each one degree grid cell during the time 1990 to 2005. As you can see the number of data falling in any given cell is usually much more than 300. It is only along the coastlines and ice that this number drops and poor quality data can enter the data product. We experimented to see how different thresholds affected resulting trends. We found little difference once a minimum threshold of 160 counts per cell was met. Ice is likely to exist more at one end of a month than another (with the exception of floating icebergs) and ice removal is necessary. We developed a mean-day-of-month quality calculation to remove ice edge grid cells where the amount of ice increases or decreases throughout the month. To handle icebergs which move between grid cells, we used the number of ice observations within a grid cell during the month to exclude when too much ice existed (number of ice observations must be <= 30). Our analysis determined that light rain has little effect on water vapor values measured by microwave radiometers, and the removal of values measured in rainy conditions can have adverse effects on this product. Comparison of SSM/I F13 vapor values to GPS vapor in rain-free and rainy conditions convinced us that little difference can be attributed to rain. For wind, we find that we need to remove data in grid points adjacent to rain to ensure the highest quality data. This is not the case for water vapor. We also found that exclusion of data adjacent to rain creates a geographic sampling problem by removing data from primarily rainy, high vapor tropical areas which results in lower mean vapor values and higher global trends. For this reason, we only excluded data from grid points with very heavy rain, so high that our microwave instrument processing does not derive an accurate vapor value. Data in regions with light to moderate rain are not excluded. We use only RSS Version-7 water vapor values in making this product. The data are from all SSM/I instruments, the F16 and F17 SSMIS, AMSR-E, WindSat, and AMSR2. Analysis of individual instrument TPW values showed that some small adjustments remained necessary before merging the data. The analysis compared all instruments listed to the TMI TPW data (TMI is not used in this product). We believe that some of the differences may be due to the later sampling time of AMSR-E or AMSR2 (1am/pm as opposed to 6-9 am/pm of the other radiometers) or are due to slight differences in calibration - use of only rain-free data as opposed to using all data (rain-free and rainy) for the intercalibration. This minor calibration difference may account for why the AMSR instruments and WindSat are slightly different from SSM/I and SSMIS. 3 satellite/month exceptions are needed in order to maintain time series consistency and avoid large data gaps. In each case, these are the only (or the best) satellite/month data available. In the case of F08, no other radiometer was in operation at that time. This TPW product is intended for climate study as the input data have been carefully intercalibrated and consistently processed. Strict Q/C requirements are used to omit data that are not suitable for climate study. For more information, see the description of the development of the product. We update the product monthly, adding the data for the last month to the time series. Trends are recalculated. The 12-month climatology supplied in the file and used for anomaly calculations is calculated by averaging all observations that pass our Q/C requirements from the years 1988 to 2007 (20 years). We will recalculate the climatology every 10 years. Some users have had trouble reading the netCDF4 format file. Therefore, we provide both a netCDF3 file and a netCDF4 file. Both files contain identical data and information. This product is constructed by merging all valid TPW (water vapor) data from SSM/I, SSMIS, AMSR-E, WindSat, and AMSR2 instruments. The netCDF file contains mean total precipitable water (TPW) values on a 1-degree grid, a 12-month TPW climatology, monthly anomalies, a TPW trend map, and a time-latitude (hovmoeller) plot. The product contains data for the global oceans at 1-deg spatial resolution and represents monthly means for January 1988 to the date of most recent processing. The product is updated monthly. There are no data values in regions of land, persistent ice, and coastal areas. Total precipitable water (TPW) is reported in kg per square meter (kg/m-2). 1 kg/m-2 is equivalent to 1 millimeter (mm). The total columnar water vapor or total precipitable water from the microwave radiometers is the most robust of all the geophysical parameters derived from radiometer brightness temperatures. TPW values range from 0 to 75 kg/m-2. We provide 2 netCDF files, both contain the same information, one is netCDF3 format and the other is netCDF4 format. Temporal coverage for this data set is monthly maps from 1988 through to the present. The product file is re-created every month by the 15th adding the previous month's value. The number of months in the data file will continue to increase until there are no more satellite radiometer instruments in operation. The file size is approximately 151 MB, and grows as each new month of data is added to the file.The remaining variables are time, latitude, longitude, climatology_time, and bounds for each of these. Any third party tool/software capable of reading netCDF files can be used (such as Panoply). We have developed a browse environment for this data product. The environment allows the user to switch between monthly mean vapor plots, anomaly plots, the 12-month climatology and the TPW trend. More capability will be added to this environment at a later date. The 'Get Data' button connects to the ftp server for data file download. More product validation results will be available soon. Journal of Climate, vol. 28, pg. 6882-6902. Science, vol. 317, pg. 233-235. Nature, vol. 403, pg. 414-416. Journal of Geophysical Research, vol. 102(C4), pg. 8703-8718. Journal of the Atmospheric Sciences, vol. 55, pg. 1613-1627.
report number 121599A-1, Remote Sensing Systems, Santa Rosa, CA, 66 pp. report number 051707, Remote Sensing Systems, Santa Rosa, CA, 6 pp. presented at 17th Conference on Satellite Meteorology and Oceanography and 17th Conference on Air-Sea Interaction, Annapolis, MD. Geophysical Research Letters, vol. 34, L24709, doi:10.1029/2007GL031936. This research was supported by National Aeronautics and Space Administration (NASA) Making Earth System data records for Use in Research Environments (MEaSUREs) Grant #NNX09AC19A. Microwave radiometer data are processed by Remote Sensing Systems with funding from the NASA Earth Science MEaSUREs Program and the NASA Earth Science Physical Oceanography Program. Please acknowledge use of this data set when used in your work.